Newly organized IAM workers at K&N Industries in Riverside, CA held a rally to demand that the company follow a National Labor Relations Board ruling to negotiate with the union. U.S. Representative Mark Takano (D-CA), pictured, called on the company to bargain in good faith. Newly organized IAM members employed at K&N Manufacturing in Riverside, CA held a rally to demand management sit down with the IAM to negotiate a fair contract. More than 600 workers at the facility produce custom after-market air filters for the automotive industry. 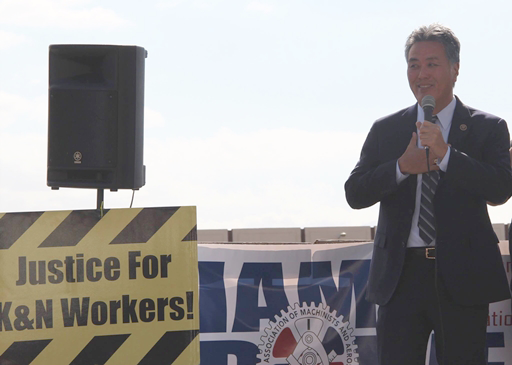 The well-attended rally included U.S. Rep Mark Takano (D-CA) calling on management to negotiate in good faith. A representative from California Assemblyman Jose Medina’s office and Riverside, CA IAM Local 964 President Bob Fisk also made remarks in support of the workers. In May 2016, workers at the K&N facility voted to join the IAM. Claiming that an unrelated group of workers should have been included in the pool of workers eligible to vote, the company challenged the results of the election with the National Labor Relations Board (NLRB). On January 20, K&N lost its challenge and was ordered by the NLRB to negotiate in good faith with the IAM. Despite the ruling, K&N is refusing to negotiate. You can show your support for our members by calling 800-858-3333, extension 4137 and tell K&N Human Resources Manager Lyn Rosas to negotiate with the IAM and its members. The post New IAM Members in California Rally Against Company Refusing to Negotiate appeared first on IAMAW.